A single page from Shadows of the Empire: Evolution, a five-part miniseries. I'm pretty meh on that mini, but I like that page. Harrison Ford is at least 40% why Han Solo was at least 60% . . .
Had Darth Vader only known that "Hey! How did that Rancor get in here?" would be as good a distraction as any allusion to paternity. Although it would only have worked AFTER the paternity allusion. It would have been better if it were faster paced. 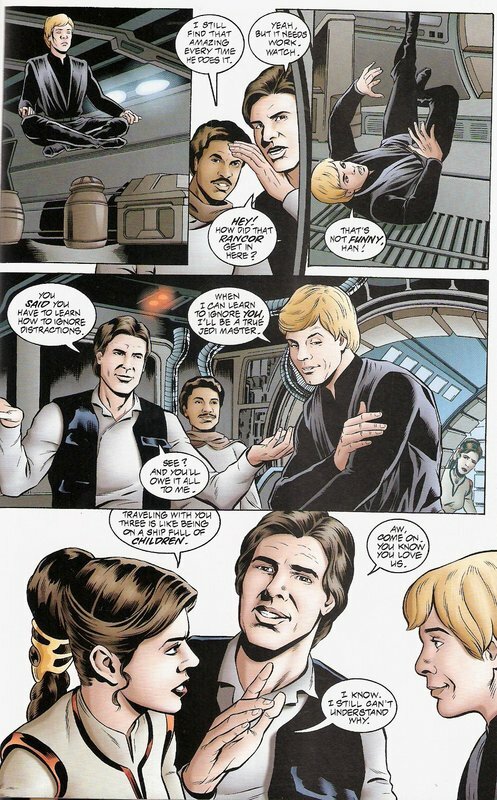 "When I learn to ignore you"
Also, Troll!Han just got my day going. If only the movies had been this good. Ok, that is an awesome page.